There are many things in life we can’t control, such as the weather or growing old. However, there are a number of things we can control, like how we react to situations, how to be honest with others and you or your child’s likelihood of developing cancer from HPV. Yes, you read that correctly. If you or your loved one is under the age of 26, you can prevent them from developing cancer from the human papillomavirus (HPV) with a two or three-shot vaccination. The word vaccine can raise red flags for some individuals, but it shouldn’t. Vaccines go through rigorous testing to make sure they’re safe and have been proven to lower the number of individuals diagnosed with preventable diseases. In fact, a 2016 study released by Pediatrics found that HPV rates have dropped dramatically since the HPV vaccination program began over a decade ago. So why are people still not getting the vaccination? Unfortunately, it leads back to a lack of education, which is why we’re sharing the truth about HPV and the vaccine. HPV is not a single virus, it’s actually a group of more than 150 related viruses that are spread through sexual contact between individuals. The CDC estimates that nearly 80 million Americans are currently infected with some type of HPV, but they probably do not know it. That’s because most HPV infections go away on their own and do not present any signs or symptoms. However, this is not always the case. Other HPV infections can last for an extended period, causing genital warts and/or cancer. The CDC reports that in the United States HPV causes 32,500 cancer cases each year including cervical and oral cancer. A common myth is the belief that HPV only impacts females, but it is false. HPV does not discriminate by gender and can be spread by and given to both males and females. Women should begin screening for cervical cancer through a Pap test every three years when they turn 21 and should have an HPV test every five years after they turn 30. There is currently no screening or testing recommended for men. What is the HPV Vaccine and What Does It Prevent? The best way to prevent cancer from HPV is with the HPV vaccine. The most common vaccines are Cerarix®, Gardasil®, and Gardasil 9®. 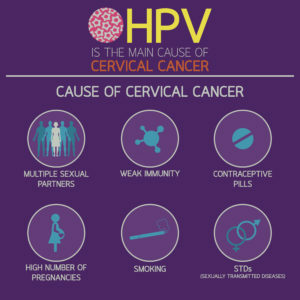 The vaccine protects against four major types of HPV, two that are known to cause genital warts and two that are known to cause cervical cancer. The vaccine is long-lasting and effective, but women should still be screened for cervical cancer since the vaccine does not protect against all types of HPV. To be the most effective, the vaccine should be administered at age 11 or 12 before the child is sexually active. However, the vaccine is recommended and safe to receive until the age of 26. For those under the age of 14, the HPV vaccine is given through a series of two shots administered six to twelve months apart. For those over the age of 15, the HPV vaccine is given through a series of three shots, administered during a six-month timeframe. If your child has not received their HPV vaccine, consult their primary care doctor at their next appointment. The HPV vaccine is safe. Before the HPV vaccine became available to the public, it went through extensive testing and clinical trials with the CDC and FDA to make sure it was safe for all individuals. The vaccine is continuously monitored by the CDC using three main systems. Through these systems, health officials, health care providers, and the public can report any problems detected with the vaccine. There have been no serious adverse events reported. There have been a few minor side effects reported, but this is not uncommon for vaccines. Minor side effects include pain, redness or swelling where the shot was given, nausea, muscle or joint pain, slight fever and headache. These symptoms typically go away on their own and do not last more than a day or two. If severe side effects are experienced or an allergic reaction occurs, consult your health care provider or go to the nearest hospital. The HPV vaccine is the best way to prevent genital warts and cervical cancer. It’s safe, effective and covered by most insurance plans. For more information about the vaccine, contact your physician or call the number on the back of your insurance card.